Disclaimer: I am not a veterinarian, nor do I have any formal training in any medical field. The information presented here is not meant to replace your vet's advice or prescribed medications, but only to suggest additional options to explore, based on your dog's condition. I no longer revaccinate my adult dogs at all, other than for rabies, as required by law. I am convinced that they have lifetime protection against all the viral diseases (Parvo, Distemper, Parainfluenza, Hepatitis/Adenovirus and Rabies). Challenge studies have been published for Parvovirus, Distemper, and Adenovirus (the others have not been studied) showing that protection lasts at least seven years; serology (titer) tests show duration up to 15 years (see Duration of Immunity to Canine Vaccines: What We Know and Don't Know and full text). These studies are ongoing, meaning the duration may be even longer; none of the studies have shown immunity to wear off. I did titers the first year, for peace of mind, but no longer do them, as I'm satisfied my dogs are protected and do not need to test them to reassure myself. See the 2017 AAHA Canine Vaccination Guidelines for current vaccination recommendations from the American Animal Hospital Association. The 2003 Report of the AAHA Canine Vaccination Task Force says, "Dogs have been shown to maintain antibody titers to the core viruses CDV [distemper], CPV-2 [parvo], CAV-1 [adenovirus] and CAV-2 in viral-free environments for many years. In a study reported in 1997, dogs vaccinated with a product containing CDV and then place in an environment without CDV maintained antibody titers for at least 10 years. In a more recent controlled study of puppies vaccinated at 7 and 10 weeks of age (and housed with unvaccinated dogs to ensure CDV, CPV-2, CAV-1 and CAV-2 were not present), it was shown that vaccinated dogs maintained antibody titers for more than 4 years. . . . We now know that booster injections are of no value in dogs already immune, and immunity from distemper infection and vaccination lasts for a minimum of 7 years based on challenge studies and up to 15 years (a lifetime) based on antibody titer." A study published in 2010 by Dr. Ronald Schultz, vaccination expert, et al, concluded that "even a single dose of modified live virus (MLV) canine core vaccines (against CDV [distemper], cav-2 [adenovirus] and cpv-2 [parvovirus) . . . when administered at 16 weeks or older, could provide long-term immunity in a very high percentage of animals, while also increasing herd immunity. (See Age and long-term protective immunity in dogs and cats and What Every Vet (And Pet Owner) Should Know About Vaccines for more information). The vaccinations for bacterial diseases, including Leptospirosis, Bordetella, and Lyme disease, do not provide long-term protection and in general must be be given yearly or even more often in order to provide protection. The benefit vs. risk ratio needs to be taken into account when deciding whether or not to vaccinate against lepto. Lepto is spread through the urine of infected animals, so dogs who spend time outdoors, swim in potentially contaminated water, or drink from water (including outdoor water dishes) that might have come in contact with wildlife are at greater risk than those who spend most of their time indoors. In the past, there were more side effects reported for the lepto vaccine than for all the other vaccines combined, but a large vaccine study showed that the newer lepto vaccines have no increased risk for adverse effects. Giving the lepto vaccine separately from other vaccinations may help to prevent a reaction. Lepto vaccines protect against two to four (depending on the vaccine) of the most common serovars that affect dogs, and likely provide some cross-protection against other serovars as well. The vaccine does not always prevent the disease but should lessen the severity. The vaccine is considered good for one year, but protection may last 9 months or less. Because lepto infections are most common in the spring and fall, vaccinations should be timed to try to cover those periods. Update: Merial now offers a recombinant vaccine that addresses some of these issues; see Recombinant Vaccines below for more information. I do have some concern about lepto, which is found in my area. If one of my dogs ever developed any symptoms, I am prepared to treat immediately with amoxicillin (supportive care with IV fluids might also be needed). See A Primer on Leptospirosis (along with the comments below the post) for a discussion on this topic. Bordetella is one of many forms of kennel cough. Dogs who live in kennels, are boarded, or who are exposed to a lot of other dogs, such as at dog shows, are at greater risk. Kennel cough is rarely fatal but can be very uncomfortable for the dog, and is highly contagious. I do not give the bordetella vaccine, as I believe the risk of exposure is low for my dogs. See Is the Kennel Cough Vaccine a Wise Choice for Your Dog? for more information on the bordetalla vaccine. The Lyme vaccine can induce the same symptoms as the disease, but they do not respond to treatment, although I'm not sure if this is still true for the newer recombinant vaccine. The vaccine also has limited efficacy (only protects about 50% of dogs that get it, and doesn't last very long). I don't vaccinate my dogs for Lyme disease for these reasons, and because the risk of exposure in my area is quite low. 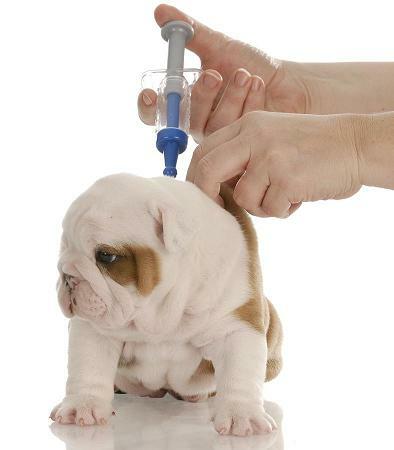 Note that if you do vaccinate for bacterial diseases, these vaccines should be separated from those given for viral diseases, according to veterinary vaccine specialist Ronald Schultz, and the lepto vaccine should never be given before the age of 12 weeks (see What Everyone Needs to Know About Canine Vaccines and Vaccination Programs, pages 62-64). There is another version of this paper available that offers answers to some commonly asked questions. It is best to give rabies separately from any other vaccines. For more information about rabies laws and occurrence in your state, see RabiesAware.org. Note that modified live canine distemper virus vaccines can suppress the immune system for up to 9 days when combined with canine adenovirus vaccine. This does not occur when the recombinant distemper vaccine is used (see below for more information on recombinant vaccines). See Canine Distemper & Vaccination for reference. I get my dogs as adults and so do not have to deal with puppy vaccination issues. I think that if I had a puppy, I would vaccinated only for parvo and distemper, and would titer two weeks after vaccinating to see if the vaccines were effective. If so, I would not revaccinate. If the vaccines did not take, due to interference by the maternal immunity, I would repeat the vaccinations and testing. For those who prefer to give different vaccines separately, I read secondhand that Dr. Dodds recommends Neopar for parvo. Schering-Plough used to make a separate distemper vaccine but discontinued it in January 2011. Titers: What do they tell us? Also see Vaccinations for Your Dog: A Complex Issue, written by a vet. Here are some good websites on vaccination protocol. Note that most vaccines are recommended every three years, with many not recommended at all unless your situation calls for them. 2017 AAHA Canine Vaccination Guidelines American Animal Hospital Association (AAHA) Canine Vaccine Task Force recommendations, including for animals in shelter environments. Note the 2006 edition included references to challenge studies showing duration of immunity of at least 7 years for Canine Parvovirus, Canine Distemper virus and Canine Adenovirus (see Table 1), but 2011 version just says "Among healthy dogs, all commercially available MLV-CPV-2 vaccines are expected to induce a sustained protective immune response lasting at least 5 yr" (for the first two) and "7 yr" for the last. Vaccination Protocol for Dogs and Cats from the University of California at Davis School of Veterinary Medicine (revised 2018).. Considerations in Designing Effective and Safe Vaccination Programs for Dogs, R.D. Schulz, May 2000. Includes information on challenge studies showing that initial puppy vaccinations still provide protection 7 years later for parvo, distemper, and adenovirus. Intervet is now marketing three-year vaccines under the name Continuum. To the best of my knowledge, there is no difference between these vaccines and any others, except that the maker has tested them for a three-year duration of immunity rather than just one. This may make your vet feel more comfortable about giving vaccines every three years rather than annually, even though all viral vaccines will provide this longer immunity. Continuum offers individual vaccines for parvo, rabies, Lyme disease, leptospirosis, and coronavirus. The Lyme vaccine uses recombinant technology that may be safer than older vaccines. They also offer some simple combination vaccines that would be better than the 5-way (and more) vaccines that are often given, but I recommend vaccinating for rabies separately. Also, the combination respiratory vaccine must be administered yearly due to the inclusion of bordetella, a bacterial disease, even though revaccination is not needed for the other two components, adenovirus and parainfluenza, which are viral and therefore immunity is much longer-lasting. High Titer parvo vaccines are now available that have been developed to override maternal immunity by using especially large amounts of the virus and thus offer protection at an earlier age. I have no information as to whether these vaccines are as safe as the regular kind. See Parvo Vaccinations Options/Prevention for more information. There are now two in-office titers tests, TiterChek (manufactured by Synbiotics Inc. and distributed by Pfizer) and Canine VacciCheck (produced by Biogal Laboratories), that can help determine if a dog is protected against parvovirus and distemper, plus adenovirus (Vaccicheck only). See What We Need to Know about Vaccination and Titre Testing for more information about both tests. Most labs now offer titer tests as well. For example, Cornell charges $49.50 (as of 2013) for Adenovirus-1 (Canine Infectious Hepatitis), Distemper and Parvo titer tests, or $33 for all just Distemper and Parvo. They also offer titer tests for Coronavirus, Parainfluenza (kennel cough), Herpesvirus and Influenza. Note that Hemopet (Dr. Dodds) also offers titer testing ($50 for distemper/parvo, $95 for rabies, which is the most expensive of the titer tests, according to their test request submission form). Note that these are what the lab charges; your vet will charge additional fees for drawing and shipping the blood, and may mark these prices up as well. Thimerosal (also sometimes spelled thimersol, thimerosol or thiomersal) is a form of mercury used in most vaccines as a preservative. It is possible that thimerosal may contribute to adverse vaccine reactions. A few companies are making rabies vaccines that do not contain thimerosol. Merial makes a thimerosol-free rabies vaccine called IMRAB 3 TF (the 3 designates a 3-year vaccine, and TF stands for "thimersol free"). There is also a 1-year version, IMRAB 1 TF. Fort Dodge makes a thimerosol-free rabies vaccine called RABVAC 3 TF (while it is not listed on their web site, I did confirm with them that it is still available). Thimerosal is used in other vaccine products, but I don't know of any specifically thimerosal-free versions. Update: Merial introduced RECOMBITEK 4 Lepto in August, 2010, but I just learned in November 2013 that this vaccine does not actually use recombinant technology! (See Is One Leptospirosis Vaccine Dose Size Really Right For All Dogs? for more information.) Lepto vaccines are responsible for more adverse reactions than all other vaccines combined (small dogs are particularly at risk). Protection from this new vaccine may last longer than the old ones, which only lasted for three to nine months. The new one says it lasts 15 months, though they tested one serovar only; it's not clear how long protection for the others lasts. It's also good that it protects against 4 serovars (though one offers only partial protection, according to the press release). Older vaccines offered protection against only 2 serovars, though the 4-serovar vaccine has been available for quite awhile now. Note that there are other lepto serovars that can affect dogs, so it is possible for a dog to be infected with lepto even if vaccinated. Vaccination specialist Ronald Schultz, DVM, recommends that if lepto is given, it should be separated from other vaccinations and should not be given before the age of 12 weeks. What is a recombinant vaccine, and how does it work? http://www.veterinarypartner.com/Content.plx?A=524 scroll down to the section on What is a Recombinant Vaccine and is it really better than the other available vaccines types? How Often Should My Dog Receive Vaccinations? What Vaccinations Should My Dog Get? Vaccinations Update by Jean Hofve, D.V.M. Rocky is a Yorkie-Poodle mix who had suffered from digestive problems his whole life. Click on his image to read about the diet his owner finally found to help him. Pashoshe Fisher, a Chihuahua, was a wonderful, joyful companion to his owner for 19 & a half years. He was on a high quality raw diet for over half his life. This is Ella, my Norwich Terrier.